Bangladesh Folk Arts and Crafts Museum of Sonargaon is a mini replica of the country. The main objective of this unique organisation is to preserve and display the traditional art and cultural heritage of the nation. This Museum began its journey at Sonargaon in March 1975 at the initiative of Shilpacharya Zainul Abedin, the great painter of the country. 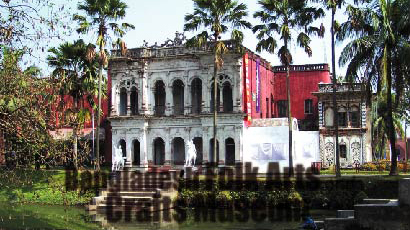 Zainul Abedin selected Sonargaon to establish this Museum for various reasons. Once upon a time this place was not only administrative capital of the country but also highly developed in culture, art and science. The ancient Tombs, Mazars, Mosques and residential areas still bear testimony to the city’s former glory. Handloom cloths were exported from Sonargaon to different countries of the world. At that time Muslin was famous for its finest quality. The main importing countries of Muslin were India, Sinhal, Pegu, Malakka, Sumatra etc. There was a sea route from Sonargaon to the present day Myanmar, Malaysia, Indonesia and Sri Lanka. Bangladesh Folk Arts and Crafts Museum is spread out on a big complex of 150 Bighas of land. It includes a big artificial lake on a land of 55 Bighas, six ponds, a library, documentation centre, sales centre of crafts, a folk stage, two folk restaurants, a rest house, a godown and three bridges, craft Village, local fruit, forestry, medicinal trees and charming garden of fruits and flowers. The museum has a very rich collection of folk objects of different materials and forms of aesthetic and utilitarian values. These undoubtedly reflect the sentiments, impulse, temperament, moods, idiosyncrasy, skill and expertise of the artists and artisans. It is a national institution, which represents traditional art heritage of Bangladesh, exhibiting objects of exceptional design and skill. There are also two Folk Art and Craft Museums to showcase traditional Folk Art and Craft and Folk culture as if they were ever living and never ending. One is Folk Art and Craft museum and the other is Shilpacharya Zainul Abedin museum. There are 11 galleries of Folk Art and Craft Museum. These are Gallery for wooden craft, Environment for village life Gallery, Gallery for Scroll Painting and mask, Gallery for different kinds of boats of Bangladesh, A Tribal life Gallery, Gallery for folk musical instrument and pottery, Terracotta Dolls, Tiles, Gallery for Agriculture and other Iron Products, Gallery for brass and bell metal crafts, Gallery for folk ornaments, Gallery for bamboo, cane and shital Pati (cool mat) and Gallery for special exhibition. In the second museum, the world famous Jamdani sari, Nakshi Katha and textiles of different parts of the country one put on display. Cultivation of cotton and the total picture of making textiles from cotton are shown attractively through diorama model. The Museum runs by the direction of the board of trustees. Head of the institution is Director. Every year the Museum authority, i.e., Bangladesh Folk Arts and Craft Foundation arranges folk fair and folk festival. Thousands of people come to enjoy the festival. With different motifs and colours, Jamdani and Nakshi Kantha are projected here. These are creations of common people. These are the great creations of our civilization. The main objectives of the Foundation are to collect, preserve, and display, carry out researches and revitalise traditional folk arts and craft of Bangladesh. Sonargaon is just 24 kilometres away from Dhaka. After crossing Kanchpur Bridge ask anyone for the location of the Sonargaon Museum. A half-kilometre narrow winding road will take you to the folk art museum.